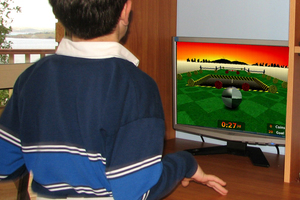 A child fitted with an accelerometer trials a computer game designed to encourage movement. CSIRO has developed computer software that aims to encourage children to be more active when playing computer games. The software is designed as an add-on to popular computer games that do not ordinarily encourage physical activity.